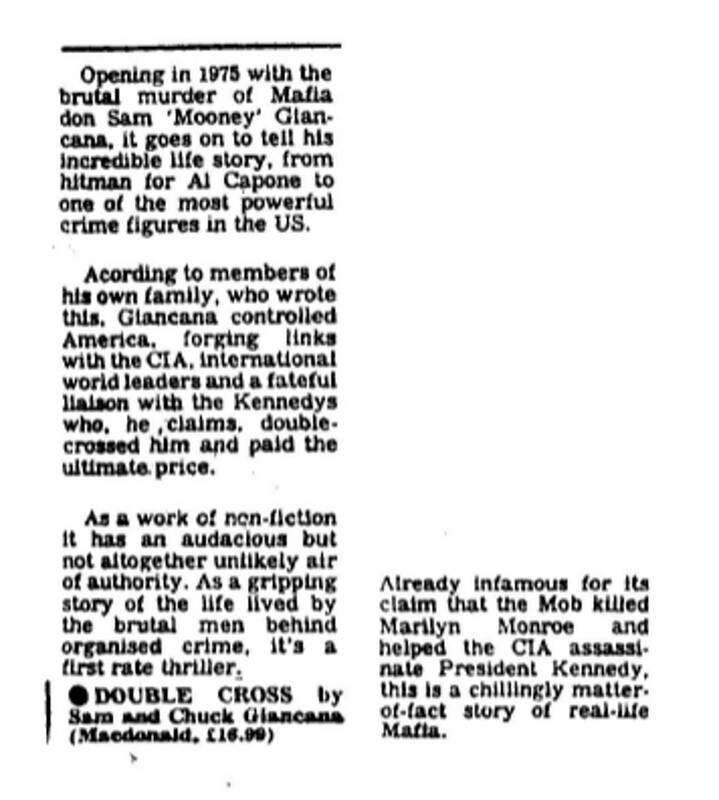 Opening in 1975 with the brutal murder of Mafia don Sam “Mooney” Giancana, it goes on to tell his incredible life story, from hitman for Al Capone to one of the most powerful crime figures in the U.S. According to members of his own family, who wrote this, Giancana controlled America, forging links with the CIA, international world leaders and a fateful liaison with the Kennedy’s who, he claims, doublecrossed him and paid the ultimate price. As a work of non-fiction it has the audacious but not altogether unlikely air of authority. As a gripping story of the life lived by the brutal man behind organized crime, it’s a first rate thriller. Double Cross by Sam and Chuck Giancana. Already infamous for its claim the Mob killed Marilyn Monroe and helped assassinate President Kennedy this is a chilling mater-of-fact story of real-life Mafia.